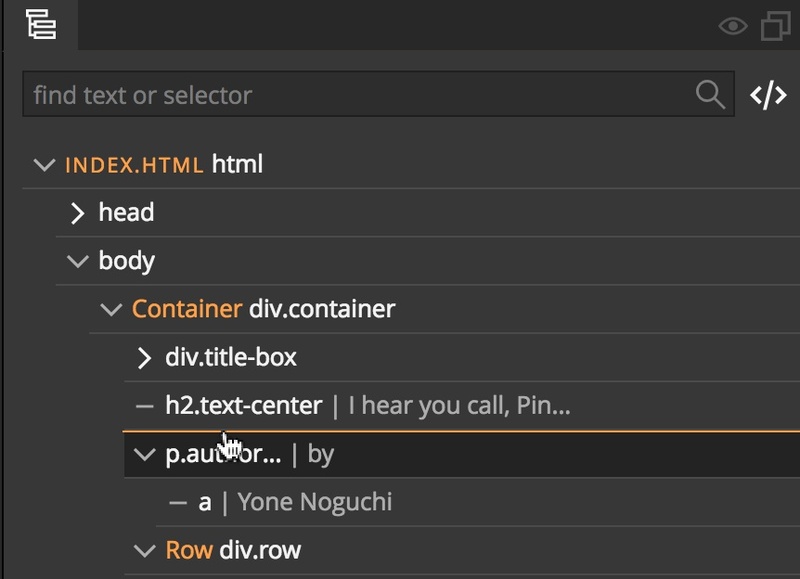 Let’s take a look at how you can add new HTML elements to the page. As always in Pinegrow, you can add elements in a couple of different ways. Choose the one that suits your task at hand the most. Library panel contains elements and components (ready-made groups of elements) arranged in sections. What sections are shown depends on which frameworks and libraries are activated on your page. For example, if Bootstrap support is active a bunch of Bootstrap-related sections and components will be listed in the Library. Moving the mouse over an element in the Library will show the preview of the element. 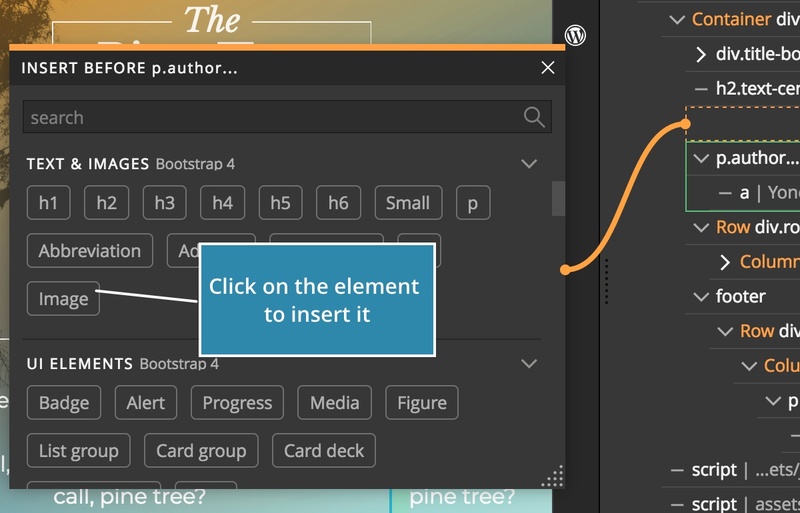 Grab the element from the Library panel and drag it over the page. Dragging the element from Library to the page. The target element is highlighted with a green border and orange line shows where in relation to the target element the new element will be inserted. Drop the element at your chosen destination by releasing the mouse button. 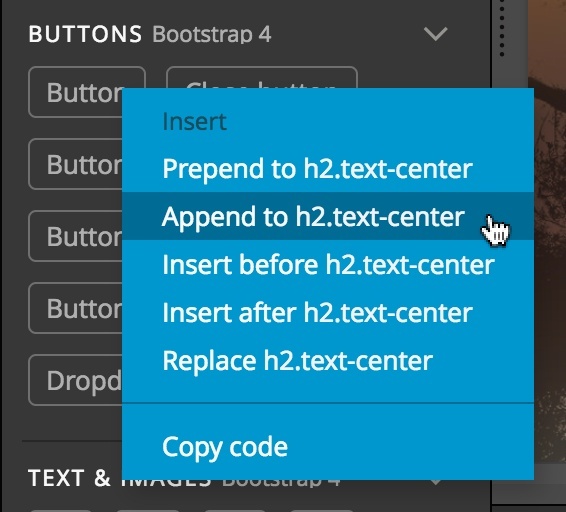 You can use Repeater to insert more copies of the element. Type a number before or during the dragging operation with 0 to 9 keys to set how many copies of the element you want to insert. Open the Library and the Tree panels. You have to select one or more elements on the page to use this feature. Insert with right click on the Library element. Use Repeater to insert more than one element to the page. In addition, for some types of selected elements, Pinegrow suggests elements that can be inserted into the element. Insert into selected heading element. Such suggestions are listed in “Insert into selected” section. To insert such element into the selected element click on the name or right click on the name for more options. Library panel lets you enter code directly to the page. 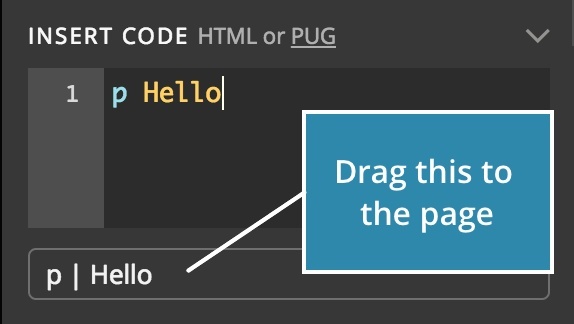 Open Insert code section and enter the HTML or simplified Pug syntax for the element you wish to add to the page. A Library panel element representing the code will appear below the code editor. Insert code from the Library panel. 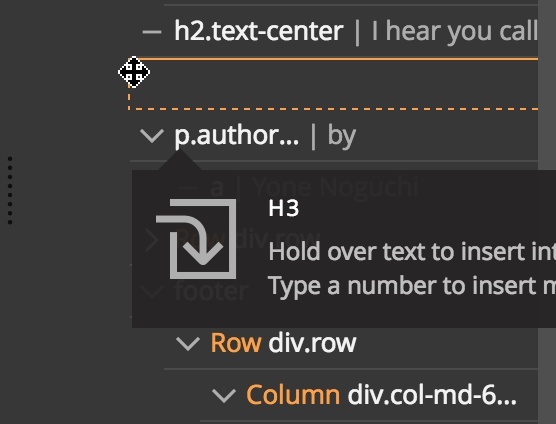 Use it as you would use a normal Library element: drag it to the page, to the tree or use right click to insert it into the selected element. You don’t have to keep the Library panel visible at all times. Click on Insert element icon in the selected element menu or press the + key to bring up the floating Library panel. Shortcut Press + to display the floating Quick insert library for the selected element. Use ESC to close the floating Library. Choose placement and click on any Library element to insert it into the selected element. 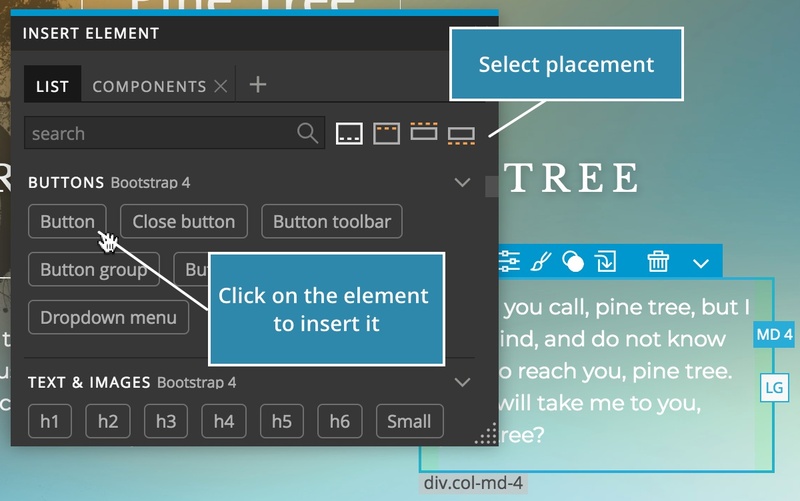 In addition to dragging elements to the page or to the tree, you can also just click on a library element to insert it into the selected element. Use position icons to chose the placement of the new element in relation to the selected element. All operations that insert new elements to the page work with Repeater. 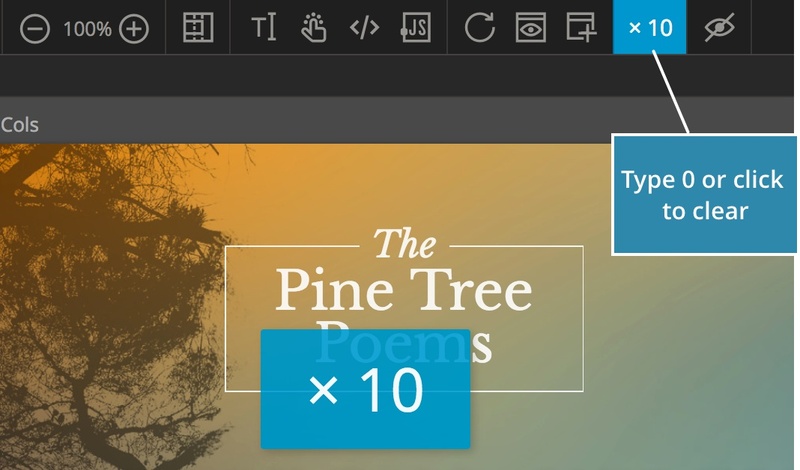 Just type the desired number before the operation or during a Drag & drop move and Pinegrow will add that many copies of the element to the page. Let’s say we need to insert a new element into multiple elements on the page. For example, we need to add a button into each of the ten DIVs. With Pinegrow, we can do that with one move. 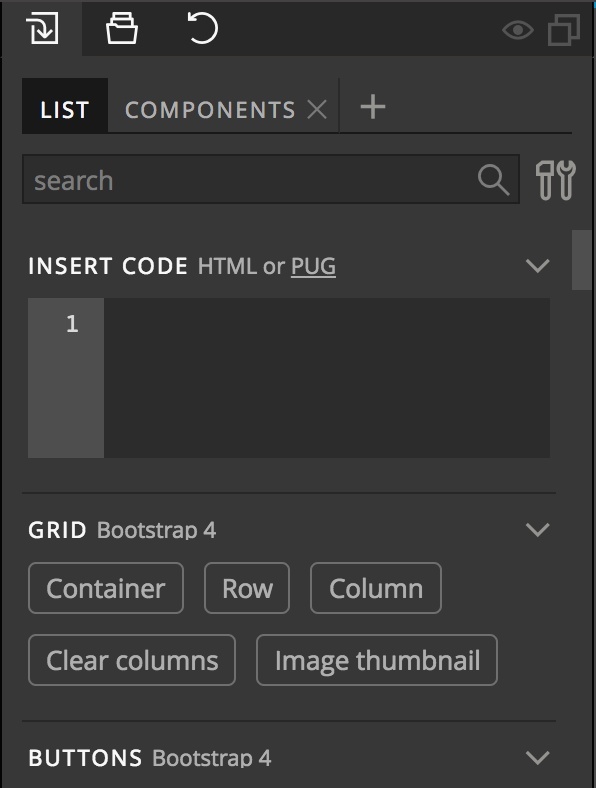 Inserting a button into one of the selected elements. …Pinegrow will analyze the situation and repeat the same operation on all selected elements. Buttons were inserted into all selected elements.